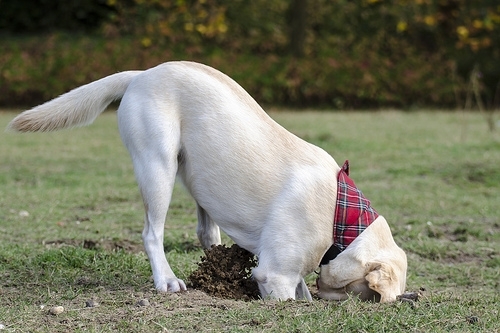 Digging is a common behavioral trait in dogs. While most owners brush it off as nothing more than a dog being a dog, it can often attract fleas. The longer your canine stays outside digging up the yard, the greater the risk of fleas finding them. So, how can you stop this behavior? The bottom line is that you have to try and figure out why your dog is digging if you ever want to stop their behavior. There could be one of many reasons causing your dog to dig, but one of the most likely reasons is because they’re simply bored. Dogs get bored easily and act out with unusual behavior as a result. If your dog isn’t getting enough mental or physical stimulation, they may start to dig holes in your yard. Another reason why dogs dig holes is because they’re upset at their owner. If you’re frequently leaving your dog or not giving them much attention, they may try to get back at you by digging holes in the yard. You need to constantly be aware of how your dog is acting to see if anything you’re doing is triggering a response by them. Once you’re able to identify the triggering response, you can then work on stopping their digging. A lesser known reason why dogs dig is to cool off during the summer. When it’s scorching hot outside, your dog may dig a foot into the ground to be able to lay on the cool ground. Depending on where you live, ground that’s a foot or so deep can be as much as 10 degrees cooler than above, making it more comfortable for a hot dog. You have to try to and find out why your dog is digging if you want to stop them. Go through the factors listed above and ask yourself what’s making your dog dig. If it’s because they aren’t getting enough mental or physical stimulation, then you’ll need to spend more time with them each and every day. Perhaps you can go outside and play fetch for 30 minutes each day, or maybe you can go for longer walks around the neighborhood. Stopping your dog from digging doesn’t have to be a tiresome process. Just identify the contributing cause and then focus on fixing it. When your dog has everything they need, they won’t have the desire to dig.